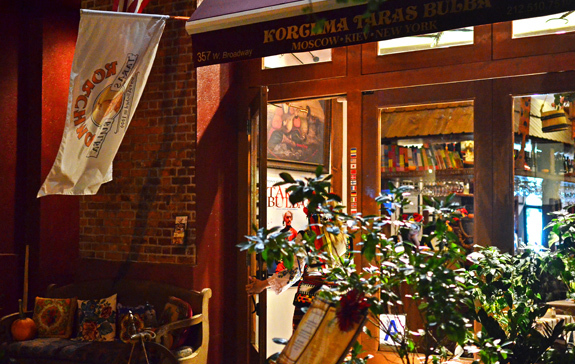 Taras Bulba is a Ukrainian restaurant chain founded in 1999, with many branches in Moscow and Kiev. The SoHo outpost, however, opened much more recently (this W Broadway space was still occupied by Via dei Mille not so long ago). I actually remember eating in one of the Moscow joints on my way to or back from some Caucasian Adventure or other. Everything looked more or less the same, from the decor to the menu, with the added benefit that in Moscow they’re open 24/7 — can you remind me again which one’s supposed to be the city that never sleeps? Time for our minute of culture. Taras Bulba, though it may sound like an insult in French, is really a novella by Nikolai Gogol, wherein a family of Zaporozhian Cossacks does Cossack things, including lots of warmongering. It was loosely adapted for film in 1962, with Yul Brynner in the title role. (Brynner was born in Vladivostok, incidentally). 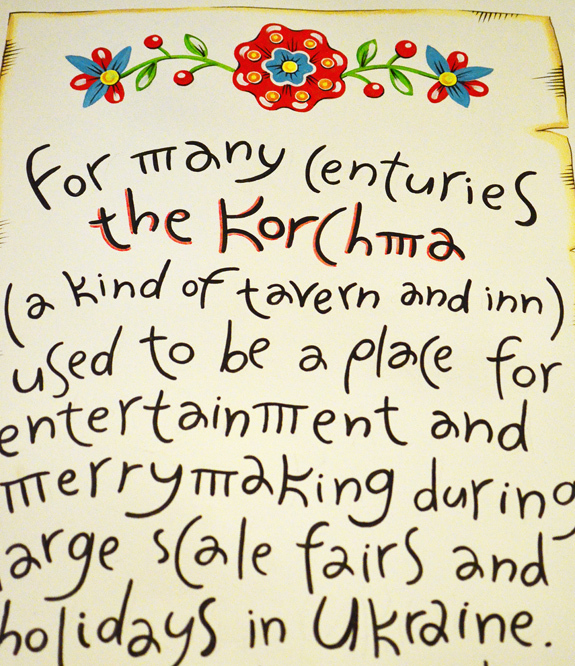 And korchma, the word printed on the awning and atop the menu, is not a schizophrenic owner’s second name for the restaurant; a “korchma” simply used to be a kind of tavern in Ukraine. As the New York Times puts it, Taras Bulba follows the usual model of “kitschy Ukrainian theme park marketed to Russians, and now, to the world”. 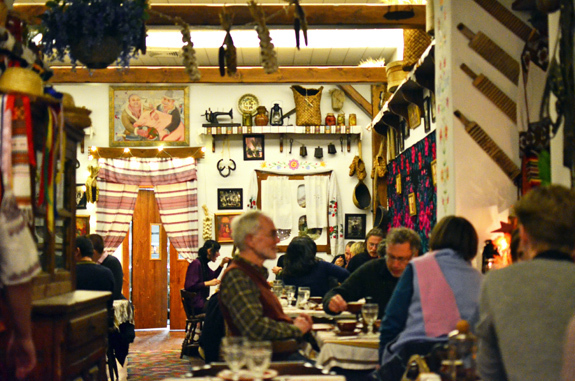 As you enter the restaurant, you are immersed in a backwards stereotype of peasant Ukraine. All the waitstaff wear traditional costumes, agricultural tools of another age hang on the walls, and Cossacks are still surrounded by a romantic aura, especially when played by the seductive Yul. 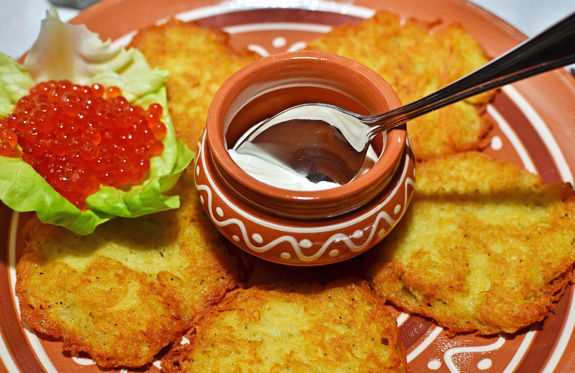 The lengthy menu does a great job of focusing on Ukrainian cuisine, with some extra Russian dishes. There are the traditional plates of cold meats, cured fish, or pickled vegetables, 3 kinds of borscht, blini and draniki, sausages and cutlets, 7 different kinds of varenyky and pelmeni, stews and grilled dishes, and much more. 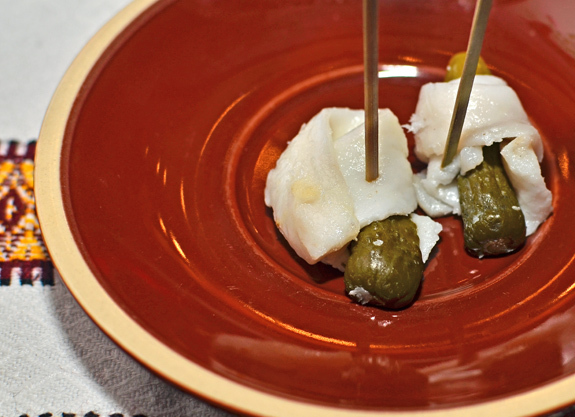 I also remember seeing a couple of Caucasian dishes. 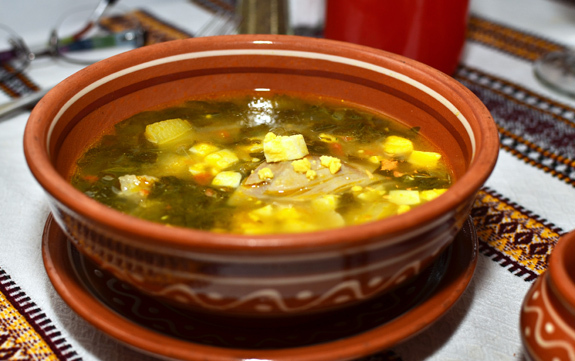 Ukraine’s most famous specialty is pork fat. If you didn’t know this when you arrived, Taras Bulba makes sure you’ll remember it by the time you leave. Dinner starts with smalets, a spicy spread of rendered pork fat, a little bit like French rillettes but with the lean meat. It tastes quite good on bread and goes really well with vodka. But wait! Each shot you order also comes with a gherkin wrapped in fat. Even if the fat is cut a bit too thick, and you’re already eating your smalets, this is a nice gesture. 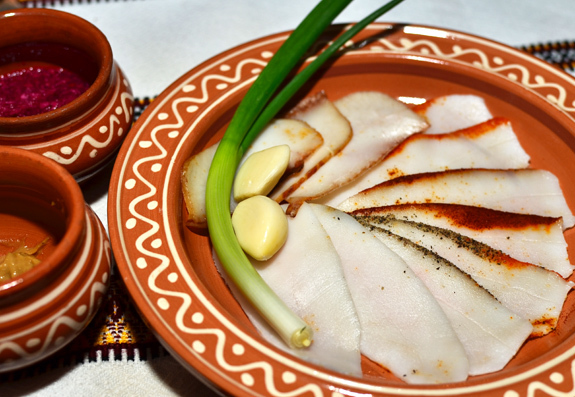 Ignoring the scarecrows of clogged arteries and heart disease doubtlessly made up by Western doctors who know very little about the miraculous virtues of vodka, we also decided to order the salo, a whole plate of pork fat, presented in four versions: plain, black pepper, paprika, and smoked. Eaten on a slice of black bread with mustard or horseradish, all of them were enjoyable but could have been sliced a bit more thinly. 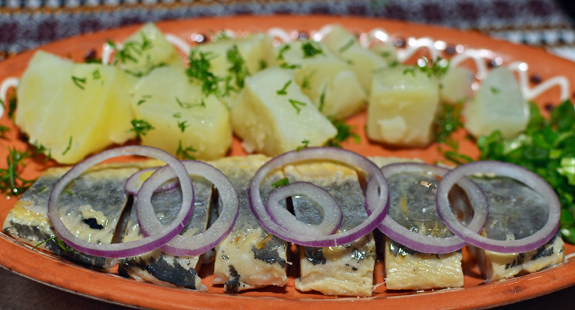 The cured herring served with boiled potatoes and onion was another well-prepared classic. The fish looked homemade, and the potatoes cut the saltiness of the herring. 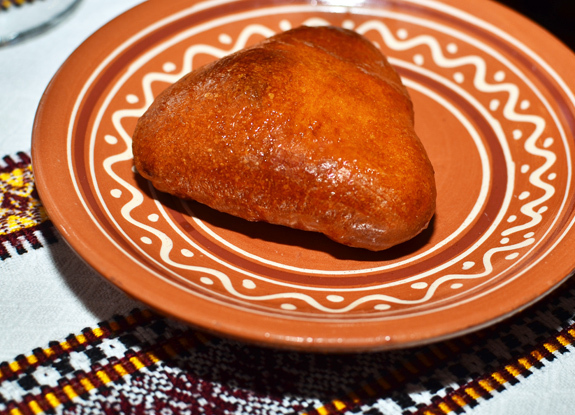 The pirozhki, ordered by the piece, were available with meat, potato-mushroom, and cabbage fillings. We tried the meat pirozhok. The bun contained a bit too much dough, and the meat wasn’t too compact but wasn’t really juicy either. Overall, it was still above average. Of the various borschts on the menu, the sorrel borscht really stood out. Instead of the cabbage and beets one would expect, it was made of sorrel, carrot, onion, egg, potatoes, and chicken — Ukraine has a somewhat enlarged conception of borscht. The soup was very thin, more like a broth. This wasn’t really my thing, but there was nothing wrong with it, and I figured I should make an effort to try more soups in my reviews. The draniki (or should we say deruny?) were available plain with sour cream, or with extra salmon roe. 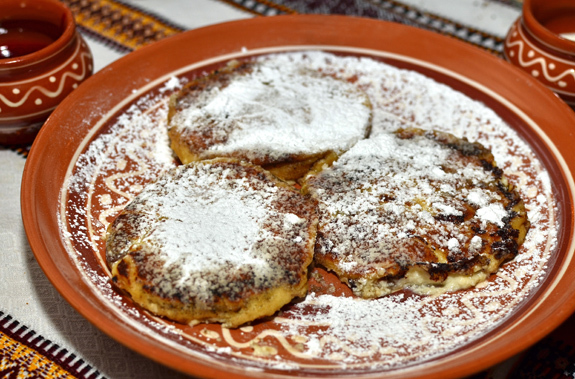 The pancakes, crispy and quite thin, boasted a good potato taste, and made for a copious appetizer. They were a good match for the salmon roe, a fairly generous portion of good-quality eggs (one thing I look for in roe, apart from taste, is a thin skin, even if that often means smaller eggs). 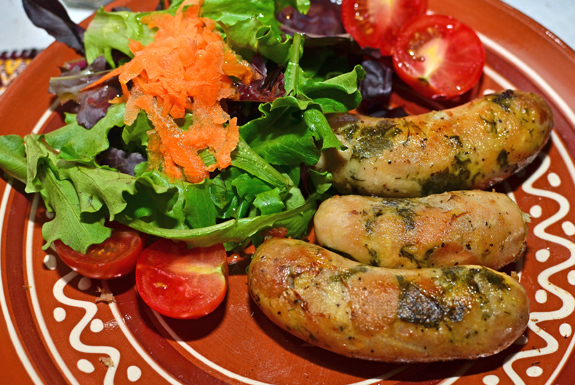 Among the main courses, I really liked the chicken sausages. The chicken meat, mixed with herbs, was fairly lean and yet not dry. These typically Ukrainian sausages really tasted like chicken, and not some mystery white meat. Too bad I didn’t care much for the salad. In general, the sides were not this restaurant’s forte. 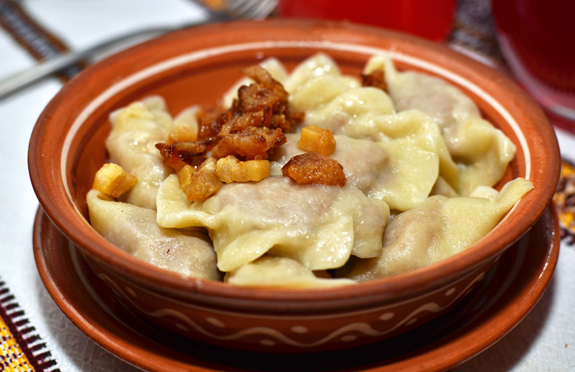 Since the menu offers both meat varenyky and pelmeni, you might wonder if there is any real difference beyond shape. Why, yes there is! In varenyky, the meat is ground very finely, most likely in a food processor. The varenyky at Taras Bulba, sprinkled with pieces of fried pork fat and apple on top, were definitely worth trying, and managed not to be dry (the usual pitfall). 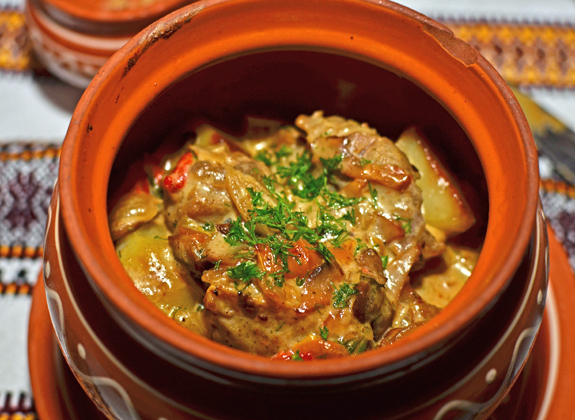 The veal in a pot would have been called zharkoe po-gutsulski in Moscow, where a zharkoe is a stew served in a clay pot, and po-gutsulski refers to the culinary traditions of the Hutsuls. The very tender pieces of veal were combined with onions, red bell peppers, mushrooms, and potatoes, in a cream sauce. Not only did it taste very good, but the nice variety of vegetables also made the dish pretty healthy by Ukrainian standards. The chicken tabaka, on the other hand, was less impressive. It was properly cooked, and the skin was crispy, but the chicken lacked flavor. The dish was somewhat boring, a feeling reinforced by the run-of-the-mill fried potatoes. 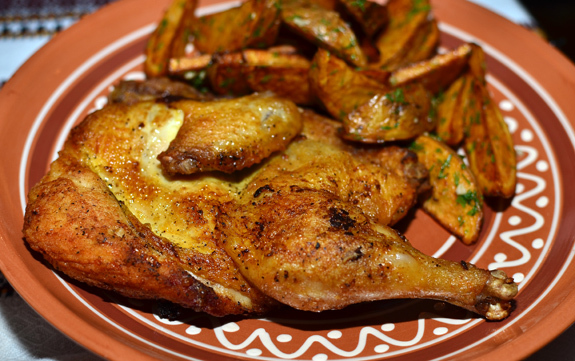 In a sense, it conformed to the chicken dishes served in most restaurants regardless of national cuisine: these are typically not the most exciting options on the menu. 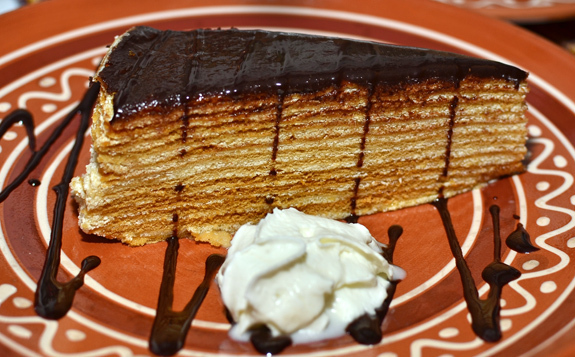 Taras Bulba also endeavors to serve a good selection of Russian and Ukrainian desserts, for best or worst. 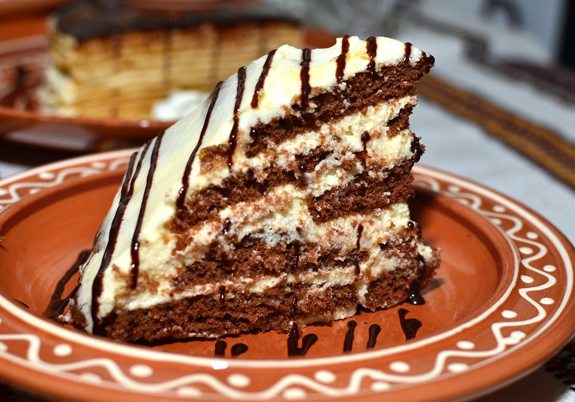 The Kiev cake, a Soviet invention, seemed to have come straight from the Kiev confectionery factory. It consisted of an anachronistic, overly sweet mess of nuts, buttercream, meringue, and kitsch decoration. I can’t really complain: I ordered a crappy dessert, and was served an authentic crappy dessert. I’m still scratching my head trying to remember whether I’ve ever eaten a dessert with blue dye in it that tasted good. The medovik (honey cake) fared only slightly better. The thin layers of cake were fine in themselves, but the chocolate glaze really tasted cheap. I’d almost guess that the glaze was the usual low-quality commercial stuff, but a recent comment on another of my restaurant reviews made me realize that I shouldn’t jump to conclusions: if one buys bad chocolate, one can prepare homemade chocolate sauce / ganache / sponge that tastes just as bad as the cheap commercial stuff! It’s quite interesting that this was supposed to be a honey cake and yet the chocolate glaze was so overpowering that I have no real recollection of tasting honey. 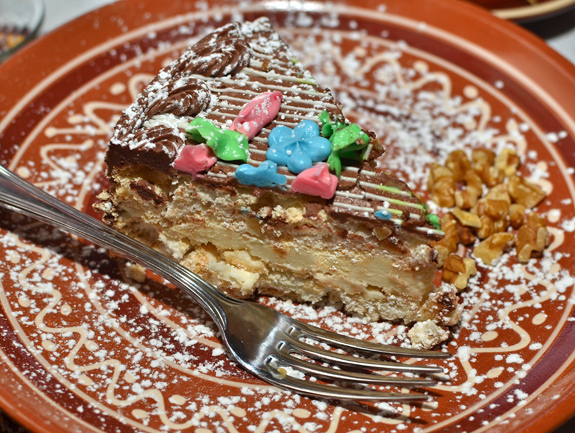 I wouldn’t wholeheartedly recommend the smetannik (sour cream cake) either, a real sugar bomb with very little flavor. The white layers were so sweet, in fact, that I couldn’t tell if they were made of cream with a ton of sugar or of white chocolate mousse — white chocolate contains 60% sugar. The milk chocolate layers weren’t much better — milk chocolate contains 50% sugar. So what of the sour cream? It was served on the side. Combining it with the cake on one’s fork certainly helped cut the sweetness. Had we known then what we know now, we would all have just ordered the syrniki. These addictive little tvorog pancakes, made to order, were so loaded with the fresh cheese that they barely held together. They tasted great on their own, with just the right level of sweetness from the confectioners’ sugar, and were also perfect with raspberry jam. There were a number of satisfying drink options. The house cocktails, with their entertaining names, were fairly good though sometimes relied overmuch on the hard liquor / sweetener / juice template. 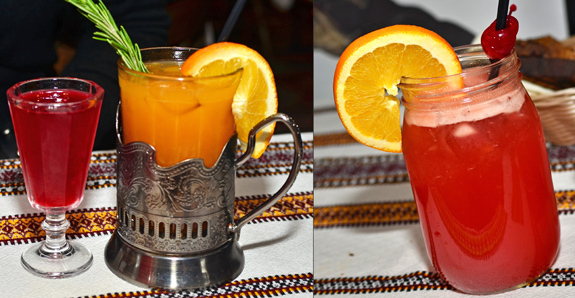 The “Trans Siberian Express” combined vodka, sea buckthorn jam, orange juice, and rosemary in a Russian tea glass. The “Drunk Babashka” was an unlikely mix of white rum, vodka, beer, champagne, cranberry mors, and orange juice. Don’t forget to ask the waitstaff about the flavored vodkas! The raspberry vodka was excellent, with a vibrant berry flavor. The horseradish vodka, something I normally hate with a passion, was quite good, with a sweet and clean horseradish taste — I could almost see myself ordering it again. The bacon vodka, however, was so-so and didn’t taste much like bacon. If you prefer non-alcoholic beverages, get one of the various iterations of mors. We were quite happy with our carafe of cherry mors. Taras Bulba takes over the top spot on my Ukrainian restaurant chart! And if they fixed the cake debacle, I would easily give them another half-point. Maybe it’s because this is part of a Ukrainian chain, whose owner is actually from Ukraine, that the eatery doesn’t dwell in that weird alternate reality that characterizes so many eateries in Brighton Beach and beyond. There’s no foie gras on the menu, no grilled Caribbean fish, no etymologically dubious chalakhach. Service is acceptable, though the place can feel like the Tower of Babel — carefully check the American, Russian, and Ukrainian flags on your ever-rotating waitstaff’s shirts before choosing what language you want to address them in.